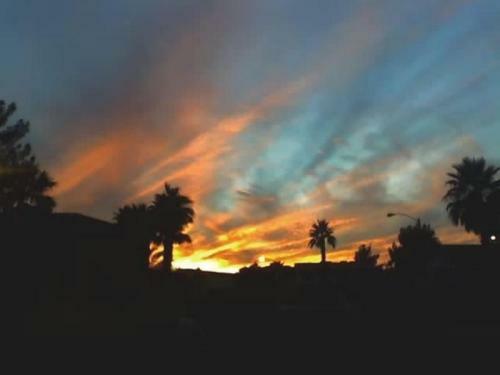 Roberta's Las Vegas Real Estate Blog: Las Vegas Sunset........Beautiful! 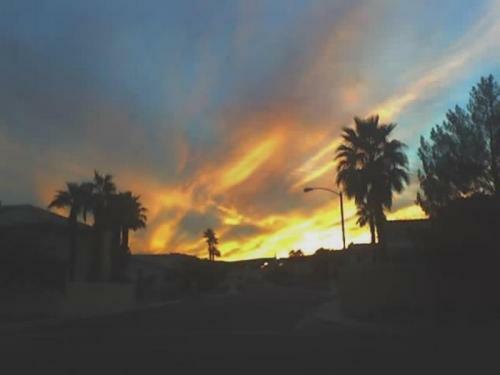 We don't get a lot of cloudy days here in Las Vegas, but when we do get some clouds, it makes for a beautiful sunset. My husband and I were walking the dog this evening and since it got dark a bit earlier, we got to see the sunset. Fortunately, my husband had his cell phone and was able to capture the gorgeous colors. Hope you all enjoy it as much as we did. My husband worked in Las Vegas building custom homes. He loved the fall and the spring there. That's when we would visit as well, and it is truly beautiful. Thanks for sharing the gorgeous sunset. Beautiful! Thanks for sharing the sunset view with us! Are those clouds or smoke from the fires in California? Sorry - bad joke. Either way, they are beautiful. Elaine: It is a beautiful here in the spring and fall. Thanks for stopping by! Sally: Glad you enjoyed the pictures. They were so pretty, I just had to share. William: Fortunately, we had no smoke here this time. A few times in the past years, we have had some heavy smoke from CA fires. Today's clouds were just the natural kind! We were out this evening also and saw this beautiful sunset. I wish I had taken the time to take a couple of pictures...these are beautiful Roberta! I grew up in the Smoky Mountains and we didn't have the beautiful skies like we do here in Texas, and that you obviously have in Las Vegas. I never saw the sun come up until I was an adult! It had to make it over the mountain first! Thanks for sharing these beautiful pictures! One of my favorite times of the day! Thanks for sharing yours! Mary: Glad you also got to see the beauty! What a wonderful night to be out! Linda: Yes, God is a wonderful artist! It is great that you finally get to see the beautiful skies. It is something you don't want to miss. John: Our dog Sparky, was only interested in the right spot to do her business. She was much too busy to appreciate the beauty! Charles: Glad you enjoyed the pictures. It is a beautiful time of the day! Roberta - I want to be in VA right now. These are beautiful photos -the buyers would want to see it first hand. BTW -thanks for your support. Faina: Glad you enjoyed the pictures. 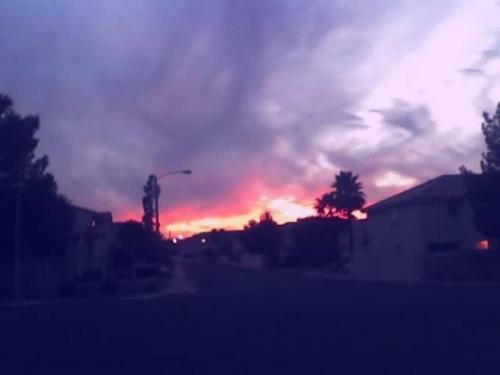 Roberta- A beautiful sunset is awe inspiring, and you're right when there are some clouds the colors can be phenominal. thank you for sharing these. Kathy: I keep looking at these pictures. They are beautiful and I am so glad that I could share them with everybody. Roberta - Thanks for sharing. 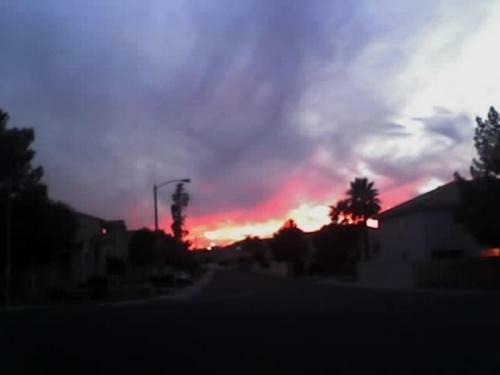 I love taking pictures of sunsets and yours are gorgeous. Jennifer: The pictures did turn out really good! Thanks for visiting! Roberta: These pictures are absolutely breath taking. Thank you for sharing them with us. Dora: I have to thank my husband for all my pictures. If it was up to me, I'd probably have pictures of my feet and my fingers! There was no storm, just clouds. Dianne: They are great pictures! Thanks for commenting. Mike, I was surprised at how good these turned out from a cell phone. Usually, everywhere we go, my husband carries a camera, except for a walk around the neighborhood. I'm glad they turned out good. Hi Roberta!! That was a great sunset the other night!!! Thanks for taking a pic and posting it. I think the pics were awesome especially from a camera phone. I'll see you at the office!! Hi Eric: I didn't realize you were part of AR. Thanks for looking at my post and I'll see you at the office! Roberta - Absolutely gorgeous! These were from a camera phone...impressive! Sal: Thanks for stopping by and commenting. I am still shocked that a camera phone took these pictures!